Does this mean that mail gets delivered at warp speed? Reddit user ModXMV has one cool uncle. ModXMV posted a pic of the uncle's creation, a DIY "Star Trek" mailbox dubbed the NCC-USPS. In my imagination, the uncle is actually a Scottish engineer in a red shirt. 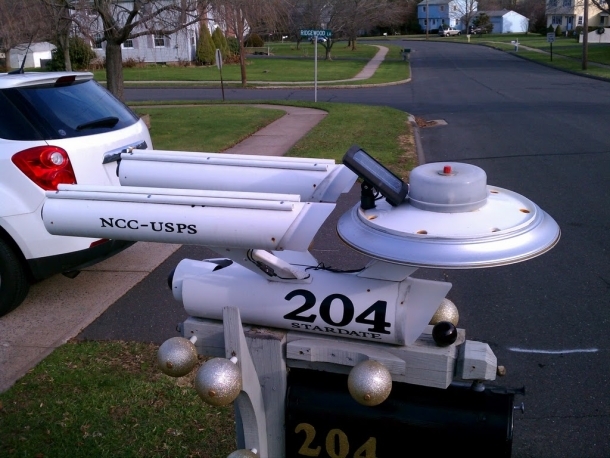 The project consists of a standard mailbox with an original-style Enterprise docked above it. This would be right at home outside of William Shatner's mansion. The mailbox looks like it provides ample room for deliveries of back issues of "Starlog" and shipments of props purchased on eBay. There's no word on whether or not it is phaser-proof. Here's hoping that a crew of disgruntled "Star Wars" fans doesn't come around swinging light sabers at the NCC-USPS. The solar-powered creation lights up a night to help guide postal deliveries at late hours. It may also function as a beacon for the next time the Enterprise crew ends up back in time on Earth to save the whales.